Record McDonald's crowd watches the balance and ball control of the East win handily over the West. 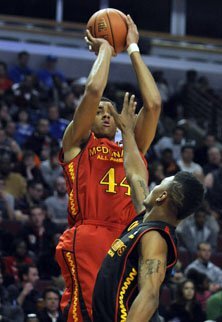 CHICAGO - Defense might not have been the priority at the boys’ 34th McDonald’s All-American Game, but the entertainment quotient more than made up for it in a 111-96 East win at the United Center Wednesday. Michael Gilchrist and James McAdoo were co-MVPs: Gilchrist (who will go to Kentucky) had 16 points and 12 rebounds and McAdoo (North Carolina) scored 17 points. The duo led five East players in double figures. Bradley Beal (Florida) had 17 points, P.J. Hairston (North Carolina) 15 and Quinn Cook (Duke) 14. The East did a superb job of taking care of the ball with only seven turnovers, while the West turned it over 18 times. McAdoo, nephew of one-time NBA MVP Bob McAdoo, deflected credit after the game. He didn't need to. With a series of spectacular dunks and even a pair of 3-pointers, McAdoo deserved the honor. “Our guards did a good job of getting our big guys the ball,” he said. Khem Birch (Pittsburgh) topped the West with 15 points and 10 rebounds, and Anthony Davis (Kentucky) and Austin Rivers (Duke) each had 14. Teammates Kyle Wiltjer (Kentucky) added 11 points and Cody Zeller (Indiana) 10.
points and was named co-MVP. Rivers didn’t have the usual “whatever” reaction to losing in an all-star game. The East jumped ahead quickly 11-4 as Beal (Florida) had seven quick points, but the West came back to tie it. Anthony Davis (Kentucky) finally tied it at 19 on an alley-oop pass from future teammate Marquis Teague. From there, the game see-sawed back and forth, with 3s and dunks the primary means of scoring. Hairston dropped in two long bombs from straight on for the East, and then McAdoo scored nine points in a 13-2 East run that ended the half. Davis then took over, though, scoring nine points in a 13-0 West outburst that started the second half, and tied the game at 57. The East regained control, though, and finally pulled away on a trio of consecutive dunks by Hairston, Chane Behanan and Kentavious Caldwell-Pope, building an 81-74 lead. Berch did his best to keep the West in the game, scoring six points down the stretch as well as adding to his final total of six blocks. The West, in fact, had 13 blocks on the evening, but turned the ball over 18 times and was just 18 of 27 from the free-throw line. The East, on the other hand, hit 14 of 16 free throws, and had just seven turnovers. Neither team was particularly good on 3-pointers, as both shot just 25 percent. Both were accurate on high-percentage and high-flying dunks. An informal count totaled 23 dunks on the night, with Behanan’s perhaps the most spectacular. Old-school fans were more appreciative of Wiltjer’s (Kentucky) hook shot, however -- but there was only one of those. Notes: The attendance of 20,019 - which was standing room only - set a record for the game, breaking the 2003 mark when LeBron James was the main attraction. The last time the game was in Chicago was 1982. … Always a fun part of the night are the celebrity sightings: Doc Rivers, of course (Austin’s dad), Alonzo Mourning, Pat Riley, Ernie Banks and the McDonald’s game’s all time top scorer, Jonathan Bender. ... Austin Rivers not only was unhappy with losing, he also had to deal with a clip shown on the Jumbotron that ended with him doing a little rap about basketball. “I didn’t want them to play my rap,” he said mournfully. “I was waiting for the horn to go off but unfortunately it didn’t.” ... Cody Zeller and Marshall Plumlee are part of brother acts, as Cody’s brothers Tyler and Lou both were McDonald’s All-Americans, and Marshall’s brother Mason also played in the game. ... The players were uniformly grateful for the crowd and the experience. “Thousands of kids at home are wishing they were us,” Davis said. ... Amid the alley-oops and broken ankles in the first half, several old-school waves rolled through the crowd, and the cheering momentarily confused the players. ... The East now holds a 19-15 edge in the series. Michael Gilchrist 5-13 6-6 16, James McAdoo 8-13 0-0 17, Johnny O’Bryant III 3-8 3-4 9, Quinn Cook 6-13 0-0 14, Brad Beal 7-14 2-2 17, P.J. Hairston 6-12 0-0 15, Chane Behanan 2-5 0-0 4, Kentavious Caldwell Pope 2-6 2-2 6, Rakeem Christmas 1-4 0-0 2, Shannon Scott 2-3 0-0 4, Marshall Plumlee 2-3 1-2 5, Michael Carter-Williams 1-4 0-0 2. Totals 45-98 14-16 111. Wayne Blackshear 1-3 0-0 2, Cody Zeller 5-6 0-0 10, Anthony Davis 5-8 4-5 14, Austin Rivers 5-14 1-4 14, Marquis Teague 4-10 1-2 9, Amir Williams 2-2 2-2 6, Kabongo 0-6 2-2 2, Kyle Wiltjer 4-10 2-2 11, LeBryan Nash 1-3 0-0 2, Branden Dawson 4-5 1-4 9, Khem Birch 5-11 5-6 10, Adonis Thomas 1-9 0-0 2. Totals 37-87 18-27 96. 3-point goals: East 7-28 (Hairston 3, Cook 2, McAdoo, Beal), West 4-16 (Rivers 3, Wiltjer). Rebounds: East 50 (Gilchrist 12), West 56 (Birch 10). Assists: East 23 (Gilchrist, Beal 4), West 20 (Kabongo 5). Turnovers: East 7, West 18.